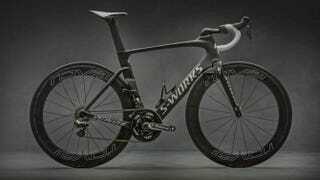 Then, this S-Works Venge ViAS would be $360,000. How? Let’s assume a standard appliance car that everyone has seen in beige, Accord, is the touchstone of pricing your personal transportation. Equal that to a standard transportation sporting road bicycle that is marketed as great but is really just average with average parts bike. That would be $1000 roughly for a good solid corolla of the road-bike world. The Accord is thirty times as expensive so lets put that against the $12,000 of the S-Works Venge ViAS. So, Is it really the same difference in performance as the Ferrari F-12 Berlinetta? ($323,000...or lease for $5,300/month) Possibly. Can this bike actually be thirty times the value, performance and prestige that an aluminum mid-range Trek bike has? They claim all of their research has gained 5 minutes of time savings over a 40 minute ride. That’s of course when using their helmet, their shoes, their skinsuit, etc as a total package. Of course you can’t be riding like a feeble and expect to get to work five minutes faster than you usually do. The pro guys racing these bikes will average 25mph over 150 miles. In the big pack (peloton) they will move as a unit cruising at over 30 mph and in the finish line sprint they reach up to 43 mph when dumping 1700 watts to the pedals....ad that’s after they rode 125 miles. So any aero advantage will not only make them move faster when trying to break away and stay away, but also save energy when riding in that NASCAR restrictor-plate-draft peloton. Notice every single control is internally routed. Electric shifting, fared brake locations, etc. So, it goes plenty fast, even if the rider is responsible for most of the aerodynamics, every little bit helps. So when the rider has reached his or her maximum ability to be aerodynamic, here is the next step up. If you have $12,000 in disposable income. Just don’t have a fall and crack the frame. If you want to see it in action, this bike debuts on the Tour De France starting July 4th.